Accredited CPR Services is a St. Louis based company dedicated to providing CPR/AED, First Aid, Stop the Bleed, Safety, OSHA, and EPA training throughout Missouri and Illinois. All training programs are tailored specifically to your needs by utilizing both the structure of standardized classes and the flexibility of online training. 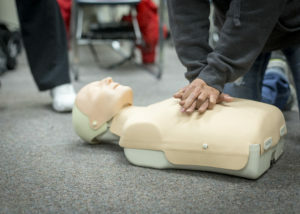 In this way, Accredited CPR Services can help you to ensure compliance with mandated state and federal regulations while working within your time and budgetary constraints. ACS offers classes for both individuals and groups – online, onsite or at one of our offices in Saint Louis. Group classes can be scheduled 24 hours a day, 7 days a week. ACS is an training provider for certifications through the American Heart Association, American Safety and Health Institute, Red Cross, ILCOR, OSHA and the EPA. We are also an approved provider through the State of Missouri for childcare providers to receive certifications and continuing education hours. Please contact us for any questions or to schedule your next training class.